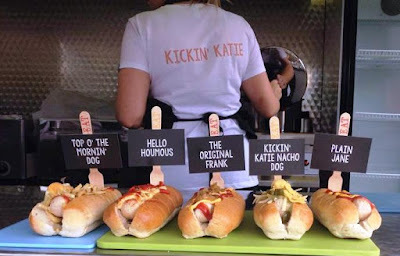 Not Dogs Summer ‘Sausage Showcase’ - Kickin' Katie Nacho Dog! As June approaches, summer is finally here and there is nothing more we enjoy than devouring a Kickin' Katie Nacho Dog in the summer sunshine! We know what you are thinking…yum! The Kickin' Katie Nacho Dog is our second most popular Not Dog after The Original Frank and especially a favourite on hot, sunny days - the cooling guacamole and spicy jalapenos work perfectly together with the added crunch of our crushed nachos! You can get a Nacho Dog from Kickin' Katie and the team at our first restaurant location this year, so keep up to date with us on Facebook, Twitter and Instagram for details coming soon! It's National Vegetarian Week until the 22nd of May and, of course, at Not Dogs we are very excited! This year, it's all about celebrating the stories and traditions behind the food we eat. The National Vegetarian Society have created a little feature called 'The Kitchen Table' - a place to share meal ideas and stories that connect us to the food we all love to eat. Meat-free eating isn't necessarily about being a vegetarian or vegan but just about cutting back on meat intake for people, animals and the environment and even a single meat-free meal makes the difference so why not go veggie for National Vegetarian Week and discover all the delicious meat-free food out there! Check out the hashtag #nvw16 to see what everyone is up to this National Vegetarian Week!